MOSCOW: India on Thursday said it wants to replicate the success of Russian-assisted BRAHMOS supersonic missile project to other defence platforms and equipment as military-technical cooperation between the two strategic partners was built on a strong foundation. Embarking on his first five-day visit to Russia as the Head of the State, President Pranab Mukherjee said, "Our military-technical cooperation is built on a strong foundation. It now includes joint research, design, development and production of advanced defence systems. 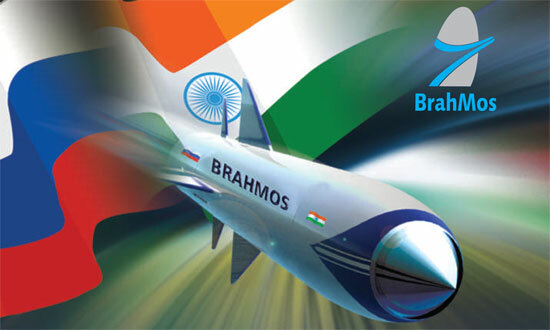 The BRAHMOS supersonic missile project is a vivid illustration." Mukherjee said India would like to apply this experience to other defence platforms and equipment. BRAHMOS is a joint venture between the Russia's NPO Mashinostroeyenia and India's Defence Research and Development Organisation (DRDO) who have together formed the BrahMos Aerospace Private Limited in 1998. "We believe that the 'Make in India' initiative provides exciting new opportunities for India-Russia collaboration in setting up manufacturing facilities in India for Russian weapons systems, their sub-assemblies and components," Mukherjee told Russian news agency 'Itar Tass' ahead of his visit here. The President said it has been discussed with Russian President Vladimir Putin, who responded very warmly to this approach. "We are also putting in place more active service-to-service exchanges, training cooperation and regular military exercises," he said. Speaking on external policy including terrorism and having a multi-polar world, he said the relationship between two countries covers a wide canvas including cooperation in multi-fora and consultations on global security issues and regional developments. He said the threat of terrorism in the "shared neighbourhood" is a matter of concern for both Russia and India. "The threat of terrorism in our shared neighbourhood is a matter of common concern. We work together in G-20 and BRICS to promote our shared interests. We look forward to Russia steering BRICS as its Chairman this year. "India has also been participating in the activities of the Shanghai Cooperation Organisation as an Observer," he said. On the energy front, the President said nuclear energy is an important component of India's energy security strategy and that India is also aware the hydrocarbons sector holds great promise. "We deeply value our exchanges with Russia in nuclear energy. The multi-phase Kudankulam project showcases the outcome of our cooperation. Last December, our two countries set out a strategic vision for further development of our cooperation," Mukherjee said. He said during Russian President Vladimir Putin's visit to India, both countries agreed to set an ambitious agenda for partnership in oil and natural gas. "This includes broader collaboration between our hydrocarbon companies in exploration and production, as well as in LNG projects and supplies," he said. Mukerhjee said both countries are also re-invigorating cooperation in Space. "In the recent Summit meeting, we identified initiatives to take our economic relations to a significantly higher level. We will be encouraging closer contacts between regions of our two countries to give further impetus in this direction. "An area of considerable promise is cooperation in education, research and innovation. We are actively working towards creating institutional linkages between our educational and research institutions," he said. The President said geopolitical realities and cultural affinities have ensured that the relationship between the two countries is marked by exceptional understanding and convergence of views, through all the realignments in the global political and economic landscape. "Russia was the first country with which India concluded a formal agreement on strategic partnership in October 2000. In recognition of the considerable strengthening of our multi-faceted relations since then, we now describe our relationship aptly as a special and privileged strategic partnership," he said. The President said there is still considerable untapped potential for further strengthening partnership between the two countries. On the commemoration of 70th anniversary of World War II, Mukerhjee said the Great Patriotic War as it is known in Russia, was one of the determining events of the 20th Century. "We recall with deep respect the millions who lost their lives during the War. Tens of thousands of Indian soldiers also sacrificed their lives in the war...It will be an honour to be part of the commemoration of the 70th anniversary, to recognise the monumental contributions of Russia to the victory over Nazism and Fascism," he said, expressing happiness that an Indian military contingent will be part of the Victory Day parade for the very first time. He said the commemoration also reminds us of the need for all countries to strive actively for peace, for the common benefit of humankind and to never forget lessons of the War. "I have had the pleasure of a long association with Russia and its leadership during my many decades in public life. It has been my privilege to meet President Putin on a number of occasions. I hosted him late last year in New Delhi when he visited India for our Annual Summit," he said. On the relations with Putin, Mukherjee said we had a warm conversation on the vibrancy of India-Russia relations, to which he has made a major contribution. We discussed the initiatives currently underway to further strengthen our bilateral partnership. "At our forthcoming meeting in Moscow, I hope to continue our conversations on these matters and on international developments of interest to both our countries," he said.